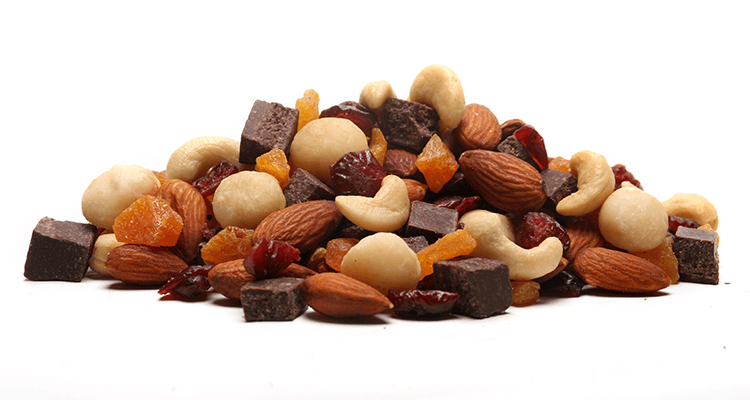 One of our only macadamia blends, Superboost is a chunky snack blend of freshly roasted nuts, dried fruit and dark chocolate. Roast Almonds (Almonds, Sunflower Oil), Diced Apricots (Apricots, Rice Flour, Preservative (220, contains Sulphites)), Orange Flavoured Cranberries (Cranberries, Sugar, Food Acid (Citric Acid), Natural Flavours, Elderberry Juice Concentrate, Sunflower Oil), Dark Chocolate (Cocoa Mass, Sugar, Cocoa Butter, Emulsifiers (Soy Lecithin, 476), Vanilla Flavour (contains Milk)), Roast Cashew Nuts (Cashew Nuts, Sunflower Oil), Roast Macadamia Nuts. Dark chocolate contains 60% cocoa solids. Contains milk, soy, sulphites and tree nuts. May contain traces of egg, gluten, peanuts, sesame seeds and other tree nuts.